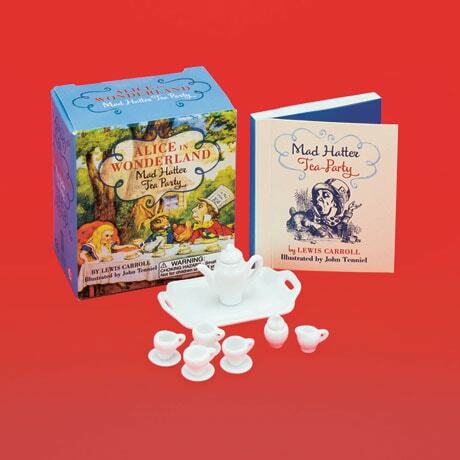 As readers of Lewis Carroll's Alice in Wonderland may recall, the Mad Hatter certainly knew how to throw an unforgettable tea party, and this set enables you to re-create it in miniature. A 1-inch ceramic teapot and a 2 ¼-inch tray are complemented here by a cream decanter, sugar bowl, and four cups, plus two sheets of stickers that can be used to decorate them. A major bonus, here too is an 88-page booklet with an extract from Carroll's novel, featuring several of Sir John Tenniel's classic illustrations. Due to the tiny pieces enclosed, this set is not recommended for children under 6.